At the end of last week I was visiting my mother near Durham, on the train unusually, and popped into the Wetherspoons in Durham as I had time to kill before the train. (I got the bus to the station, so had allowed a lot of time!) Here is the picture. For anyone in London or the south east, you will look at this and (if you can make out the price labels) think “£1.99 for a half of all those nice looking real ales – that’s not bad”. But no – that is PER PINT. £1.99. Really. 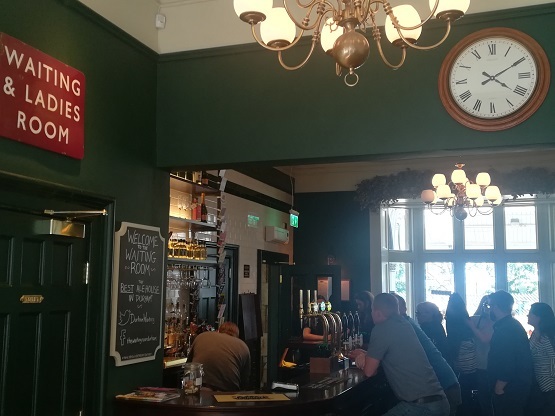 And today you get two pubs for the price of one because we must also compliment the new Waiting Room, a pub on platform 2 at Durham station created from … an old Victorian waiting room. Good beer, not as cheap as Wetherspoons but I also fell in love with whoever chose their playlist that was on during my quick half … Tom Petty, Arctic Monkeys, Stevie Nicks, early Florence, Wang Chung (Dance Hall Days), just the perfect sounds for a quick half on a station platform. So South Western Railway has an interesting new game. The platform details for the 8.39pm last night (my Farnborough train) was announced at Waterloo at precisely 8.36pm. It was also positioned at the end of the platform, so we had to walk another 150 yards past a not-in-use train to get to it – and it left on the dot of 8.39. Fine if you walk fast and are on the ball. If you are slow, disabled, have a health condition … no chance of making it. (Two of my close family members would not have made it, for sure). But they probably have a KPI around on-time departure … re-nationalising the railways will be a huge vote-winner for Labour at the next election. The Law Gazette reported that the UK’s Legal Aid Agency has cancelled its procurement for legal aid housing duty contracts following a High Court defeat at the hands of the Law Centres Network. In a damning judgment last month, Mrs Justice Andrews DBE ruled that the decision to consolidate the number of housing possession court duty schemes (HPCDS) to provide 'larger and more sustainable' contracts was ... pretty stupid really. The evidence also fell a 'long way short' of demonstrating that ministers had given due regard to the equality impact of the proposed changes, Andrews added. I was a Commissioner for several years (non-exec director, in effect) for the Agency’s precursor, the Legal Services Commission and I know what a difficult market this is. But the organisation does seem to have lurched from one contracting problem to another, on the back of swingeing cuts in the legal aid budget, it should be said. As well as our pub debate this week, I went along to another very good evening event where a bunch of CPOs talked about the big procurement issues of the day – preceded personally by a beer with a very forward-thinking CPO I have met recently. From these and other recent discussions, and technology developments, I feel that we are getting closer to a clear vision of where procurement might go in the future, and the challenges we face, and we’re going to have more on this over the summer. But where are the Millennials? OK, I don’t expect them at a CPO event perhaps, but why don’t we get more at our pub debates? What is the average age at procurement conferences? Of course, it tends to be more senior people who get the perks of attending nice events in Copenhagen or Amsterdam, but I am worried about the 20 to 30-year-old generation. Are we getting good people into procurement, encouraging and nurturing them? I wanted to feature a football song here and had forgotten this one until a bit of judicious Googling reminded me. In a week where England beat Colombia and we saw a re-released box set featuring the great and very much missed Kirsty MacColl’s work, this is very appropriate. It is only peripherally about football but its excellent, that’s main thing.